Pronounced - five ten. We are local. We live and we paddle in the 510 area code. The waterline is the line where the hull of a ship meets the surface of the water, in concept or reality. A waterline is also the name of a special marking also known as the International Load Line or Plimsoll line which is located on a ship’s hull indicating the maximum depth to which the vessel may be safely immersed when loaded with cargo. This depth varies with a ship’s dimensions, type of cargo, time of year, and the water densities encountered in port and at sea. Once these factors have been accounted for a ship’s captain can determine the appropriate Plimsoll line needed for the voyage. A Plimsoll mark on a ship can be as simple a just a circle with a line through it to indicate whether or not the cargo is loaded evenly. The letters on either side of the circle with a line indicate the registration authority, i.e. AB stands for American Bureau of Shipping in this case. 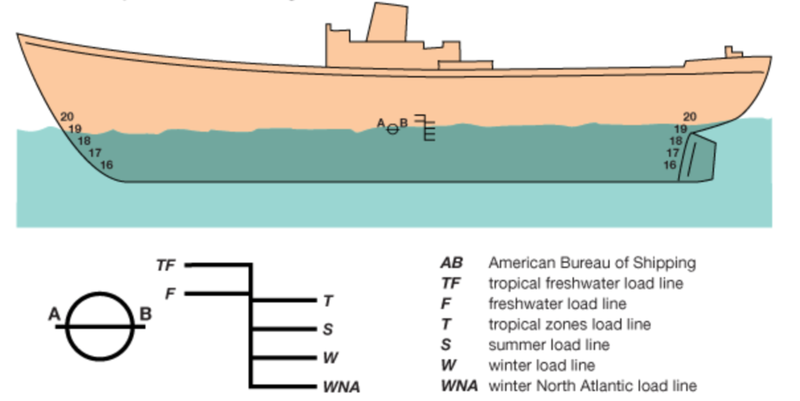 Most Plimsoll marks you will see on ships today have additional lines with corresponding letters to designate the safe waterline depending on what type of water the vessel will be traveling through; TF = Tropical Fresh Water, T = Tropical, F = Fresh Water, S = Summer, W = Winter, WNA = Winter North Atlantic. Samuel Plimsoll (1824–1898) was a member of the British Parliament who was concerned with the loss of ships and crews due to vessel overloading. In 1876, he persuaded Parliament to pass the Unseaworthy Ships Bill, which mandated marking a ship's sides with a line that would disappear below the waterline if the ship was overloaded. The waterline is found midship on both the port and starboard hulls of cargo vessels and is still used today worldwide by the shipping industry. An interesting fact; the plimsoll shoe, think Converse Shoes, is a type of athletic shoe with a canvas upper and rubber sole developed as beachwear in the 1830s by the Liverpool Rubber Company. Plimsolls had solid rubber soles about 8 or 9mm thick, to which the canvas was glued. The shoe was originally called a "sand shoe" and acquired the nickname "plimsoll" in the 1870s. This name derived, according to Nicholette Jones' book The Plimsoll Sensation, because the colored horizontal band joining the upper to the sole resembled the Plimsoll line on a ship's hull, or because, just like the Plimsoll line on a ship, if water got above the line of the rubber sole, the wearer would get wet. At 510-Waterline, we also aim to keep you balanced and dry!